Is There An Alternative To TINA? On the morning after the head of the OECD likened the Greek debt crisis to an Ebola Virus sweeping across Europe, I took part in a radio discussion with Stuart Wallis, the head of the New Economics Foundation. All agreed that HMG's deficit must be tackled, but at issue was whether we could avoid painful spending cuts by increasing tax revenues instead. This is not about new taxes, simply collecting taxes that are due, closing loopholes in the tax system and clamping down on illegal non-payment of taxes. In addition, as the Green New Deal group show, there is an enormous range of additional taxes available that would make the UK’s tax system fairer. Those with the greatest capacity to pay tax could carry more of the burden." Which all sounds much easier than discussing cuts to schools, hospitals, and welfare. So is it an alternative to TINA? To start with, raising revenue painlessly by cutting down on tax abuse sounds like a no-brainer. It's an argument the Lib Dems have already deployed, and we will be hearing a lot more of it over coming months. We've blogged this so-called Tax Gap - ie the gap between what the taxman should get and what he actually gets - many times (eg see here, here, and here). Of course, in reality it's very difficult to know how big it is, because, like the man said, we don't know what we don't know. But we came up with a total in the range £60-80 bn pa, largely attributable to the black economy. That's some way short of the £100bn quoted by the NEF, but still a big chunk of potential revenue. So we can all agree there are uncollected taxes out there, and they should be collected. The problem is that governments have been trying to collect uncollected taxes ever since the Emperor Caesar Augustus invented modern taxation back when Jesus was born. And while they always have to keep trying, there is no reason to believe we will now suddenly discover how to do it better. Especially when you understand that compared to tax collecting authorities elsewhere - eg Greece - HMRC actually does reasonably well. Which means the NEF approach ultimately has to fall back on raising tax rates. And their paper makes a number of suggestions. First, they'd completely abolish the earnings cap for National Insurance Contributions (NICs), which would mean anyone earning over £44000 pa would face a tax rise. They'd also make investment income subject the NICs, which would mean for example, increased tax on pensioner savings income. And they'd impose a range of extra bank taxes, including a tax on all payments you make from your personal bank account. But their main focus for higher taxes would be the rich, whom they define as anyone with an income above £100k pa. So all incomes above £100k would be subject to the new 50% tax rate (instead of just incomes over £150k, as now), and tax allowances would be limited to £5000. BOM readers will be quite familiar with the problems here. For one thing, only 2% of incomes are actually higher than £100k pa, which means that whacking those incomes will never raise nearly as much as an increase in broader taxes. Also, as we've blogged before (eg here), people faced with higher taxes invariably change their behaviour, cutting their liability by working less or finding some new workaround. So the tax take is always a lot less than the number the government first thought of. For example, even on the government's own numbers the new 50p tax rate will only raise just over £2bn pa, and most independent analysts (eg the IFS) think it will raise a good deal less - maybe nothing at all. And more generally, higher taxes cut economic growth. And given our current dire situation, cutting economic growth is not something any of us should feel comfortable about. Growth is the only way we can get out of this hole, and lower taxes are just about the only reliable tool at our disposal to deliver that growth. So we have to disagree with the NEF. Sadly, there is no painless alternative to TINA. In reality, there is nothing for it but to grit our teeth and cut public spending - exactly as recommended in the TPA's most excellent new book, How to cut public spending (and still win an election) - available for all good book stores now. 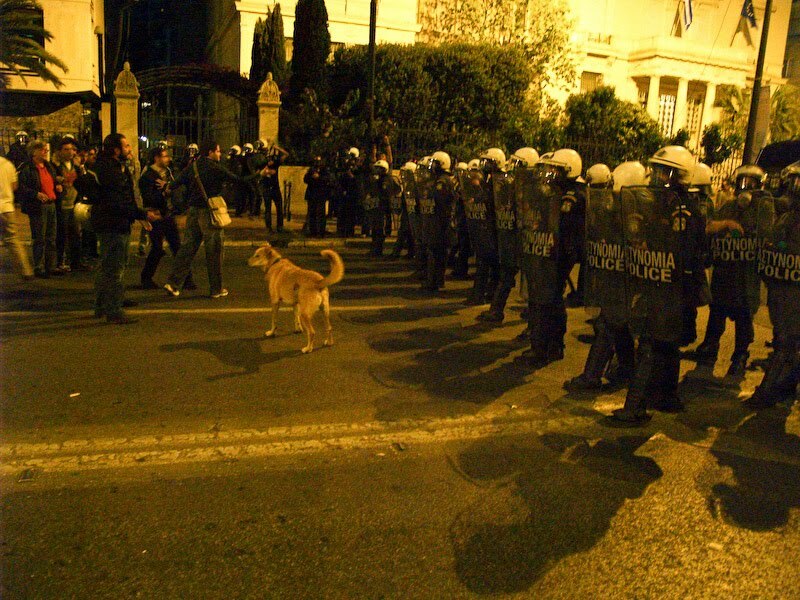 We'll simply run out of road, and find ourselves facing our own anti-IMF riots, just like the ones in Greece (pic). PS This morning's discussion took place on Colourful Radio, a fairly new DAB digital station for London. It specialises in soul music and current affairs - a fantastic combination. But the best bit is that it was set up and runs with no taxpayer support whatesoever - nothing from the government, nothing from the Mayor, and nothing from some obscure media engagement outreach quango. This is private enterprise in action, and they will sink or swim by meeting the needs of their customers. May we wish them the very best of luck.